Scott Gerhardt You don't want to draw it, and it's ability will seldom-to-never get used. At this time, I don't see this card having any use in decks or boards. I'm told it will be better later, but right now it's crap. Let's face it. You only have one card to worry about that discards from your deck, and that's Gravekeeper's Servant. How many people use that, anyways? (you Bistro Butcher/CD people from yesterday, please stay out of this =X ) Anyways, there are cards in the future that may be a reason to side deck this (Needle Worm and Don Zaruug come to mind), but just don't worry about that right now. shuffle them and form a new deck. around the corner, this card wont' see action. I'm confused. o.~ This guy has a pretty cool effect but when is it useful? Is there going to be a Millstone (Magic Reference) in Yugi or something like that? I guess this guy would be nice in a Side deck once the players start using a deck that would make him playable. When this card is sent directly from your deck to the Graveyard by an opponent's card effect, combine your graveyard cards with your own deck, shuffle them and form a new deck. Craaaaaaaap. 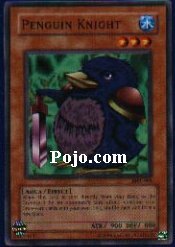 Penguin Knight has low stats and a terrible Effect in our current enviroment. If you can pull off the Effect some how, it's pretty cool. Especially if there aren't many cards in your deck left or are running out of Monsters. Don't count on it though, atleast not anytime soon.